A bus contains a 1500 kg flywheel (a disk that has a 0.600 m radius) and has a total mass of 10,000 kg. (a) Calculate the angular velocity the flywheel must have to contain enough energy to take the bus from rest to a speed of 20.0 m/s, assuming 90.0% of the rotational kinetic energy can be transformed into translational energy. (b) How high a hill can the bus climb with this stored energy and still have a speed of 3.00 m/s at the top of the hill? Explicitly show how you follow the steps in the Problem-Solving Strategy for Rotational Energy. This is College Physics Answers with Shaun Dychko. The flywheel of the bus has a mass of 1500 kilograms and a radius of 0.6 meters, and the mass of the bus including the flywheel is 10000 kilograms. The first question is, what angular velocity is needed so that the bus can go 20 meters per second, assuming 90% of the rotational kinetic energy gets turned into translational kinetic energy. And so here is us saying that we have 90%, which is 0.9 written as a decimal, multiplied by the rotational kinetic energy of the flywheel, gets turned into translational kinetic energy of the bus. And so we substitute for the kinetic energies here, we have one half moment of inertia times angular velocity squared for the kinetic rotational energy and then times by 0.9, and then that makes one half times mass of the bus in total multiplied by its translational velocity squared. Now this flywheel is a disc so its moment of inertia is its mass multiplied by its radius squared divided by two. And then we substitute that in for moment of inertia here, but first of all we’re going to solve this for omega, we can multiply both sides by two, in which case the one halves disappear. Then divide both sides by I and by 0.9, and then that solves for omega squared. And then we can take the square root of both sides to solve for omega, and so the square root of mass of the bus times translational velocity squared divided by 0.9 times moment of inertia. So then we substitute moment of inertia of the flywheel in here, and then simplify it a bit by moving this one half in the denominator to make it a factor of two in the numerator here. So this is the square root of two times 10000 kilograms times 20 meters per second squared divided by 0.9 times 1500 kilograms time 0.6 meters squared, and this makes 128 radians per second. So that’s the angular velocity that the flywheel needs in order to have enough energy to make the bus go 20 meters per second. Then, the question is how high a hill can the bus climb with the energy that it has when the flywheel is moving at this angular velocity, how high a hill can it climb and also have a speed of three meters per second at the top. So we’re going to have this rotational kinetic energy multiplied by 90% turned into gravitational potential energy plus a little bit of translational kinetic energy since it’s still going at three meters per second. So then we on the next line make substitutions for each of these terms. 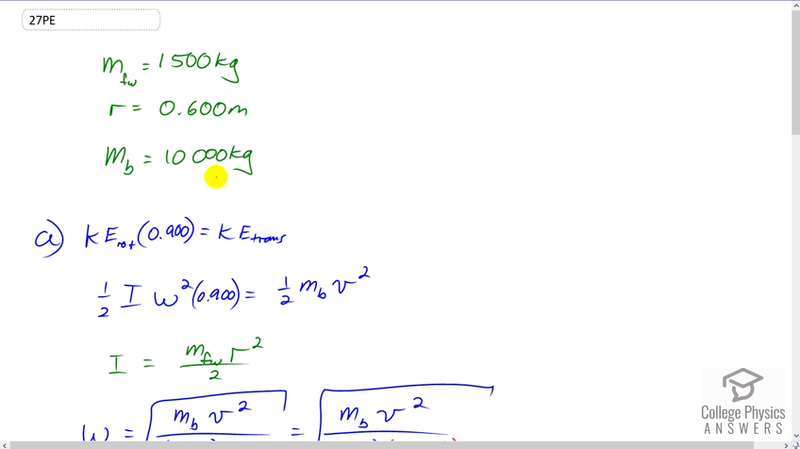 So the gravitational potential energy will be the mass of the bus times g times the height, and this height is what we’re going to be solving for in a second, plus one half mass of the bus times its translational velocity squared, and all that equals one half moment of inertia angular velocity squared times 0.9. So we’ll subtract one half mass of the bus v squared from both sides, and that gives us mgh on one side, and then we factor out the one half there. Then we’ll solve for h by dividing both sides by mb g. And so we get I omega squared times 0.9 minus mb v squared over 2 mb g, and then make a substitution for the moment of inertia of the flywheel in place of the letter I. So we get 1500 kilograms times 0.6 meters radius of the flywheel squared divided by two, times 128.3 radians per second, that’s the angular velocity of the flywheel that we determined in part a, square that, times by 0.9 minus 10000 kilograms mass of the bus times three meters per second squared divided by two times 10000 kilograms times 9.81, giving us a height of 19.9 meters.